Variety reports that NBC has cancelled the Best Time Ever with Neil Patrick Harris. The live variety hour, hosted by Harris, also featured Nathaniel Motulsky and Nicole Scherzinger. The eight-episode first season included celebrity appearances, comedy skits, stunts, games, giveaways, and hidden camera pranks. Best Time Ever… was inspired by the UK series Ant & Dec’s Saturday Night Takeaway, from ITV. What do you think? 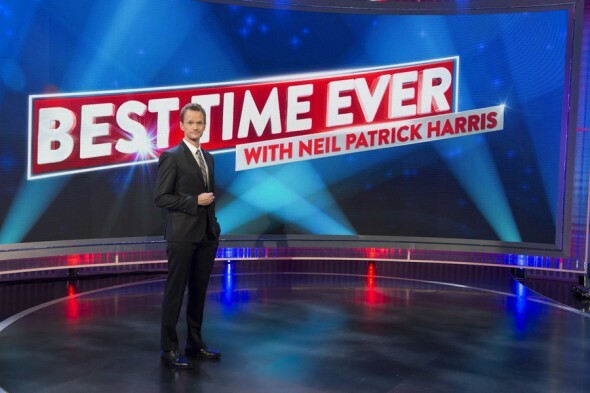 Did you like NBC’s Best Time Ever With Neil Patrick Harris TV series? Do you think it should have been cancelled? Would you have watched a second season? This show was one of the most horrible pieces of garbage that I ever witnessed. I can’t believe that anyone liked this crap show! I watched all the episodes of “Best Time Ever with Neil Patrick Harris” & I love the show. I really appreciate the hard work and intensity of the show. Kudos! to all who are part of this reality-motion series. I don’t think anyone else other than Neil would be able to carry off such an extensive show with so much agileness & spontanity. I watched all eight episodes and I enjoyed the show, for the most part. The only thing I didn’t like about the show was that the Mountain and Pacific Time viewers didn’t get to do the “Sing-Along”, since it was taped in New York. Neil Patrick Harris was a good host. Sad he won’t continue on with the show, but hopefully something will come up for his future. It should never have been scheduled for the hotly-competitive Tuesday night. NBC could have turned this into something by airing it on Friday, Saturday or Sunday nights. Bad call on NBC’s part. Just run Saturday Night Takeaway or Tuesday Night Takeaway for 13 seasons like Ant & Dec’s Saturday Night Takeaway is. Including Christmas specials. Can we please have a new show to take it’s place, now? Because I wanted that show to be called Saturday Night Takeaway or Tuesday Night Takeaway (since Best Time Ever With Neil Patrick Harris was shown on Tuesday nights). We could still have a new show called Saturday Night Takeaway or Tuesday Night Takeaway (based on the U.K. series Ant & Dec’s Saturday Night Takeaway). NBC, just broadcast Saturday Night Takeaway before Saturday Night Live. Or make a new show called Tuesday Night Takeaway in Best Time Ever With Neil Patrick Harris’ place. I didn’t even make it through the first episode – so no real surprise that it got cancelled….